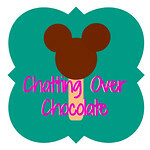 Chatting Over Chocolate: Five Loves on Friday // DIY Drive-In Movie Theater, Mother's Day, & More! Five Loves on Friday // DIY Drive-In Movie Theater, Mother's Day, & More! Happy Friday, friends! It's been such a lovely week! 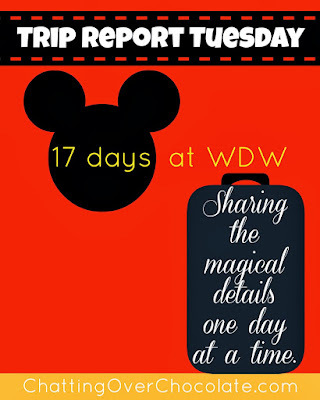 I can hardly wait to capture and share some highlights with you here today! Let's jump right in! We kicked off our celebration of Mother's Day on Saturday night creating our own drive-in movie theater! We started this tradition last summer when Jason and I were telling our girls how fun old fashioned drive-in movies were. Since we no longer have one in our area we decided to chose our favorite scenic spot in the city, take a movie on our iPad, and enjoy! This year we were able to kick it up a notch as our new vehicle allows us to hook up to its excellent speaker system. We took full advantage of it with the incredible audio in the movie of my choosing! We wanted to see The Greatest Showman from the time it was first released. Throughout its theater run my husband was battling an illness though, so this was our first time seeing it. The anticipation and enjoyment of it in this fun setting actually made me glad we had to wait! We started at sundown with delicious takeout from Qdoba Mexican Grill for dinner. 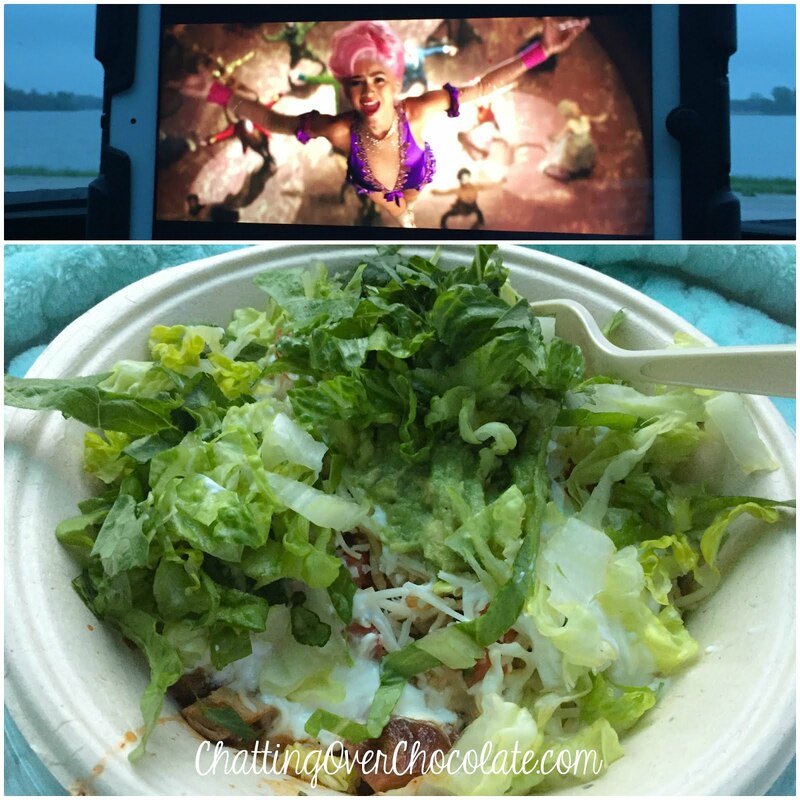 Shortly after we finished our meal the sky turned black making for drive-in movie atmosphere perfection! I know we are very late to the party on this fab flick, so you likely all know how wonderful it is already. If you haven't caught it yet, I recommend it for your next movie night! I danced in my seat, cheered, and shed a decent amount of tears. It made for such a fun start to Mother's Day with this family of mine who has my whole heart! *If you follow along on Instagram you may have seen that burrito bowl on a midweek repeat. Low cal & low carb + incredibly delicious = too good to resist craving it again and my hubby was happy to oblige. He's the best! 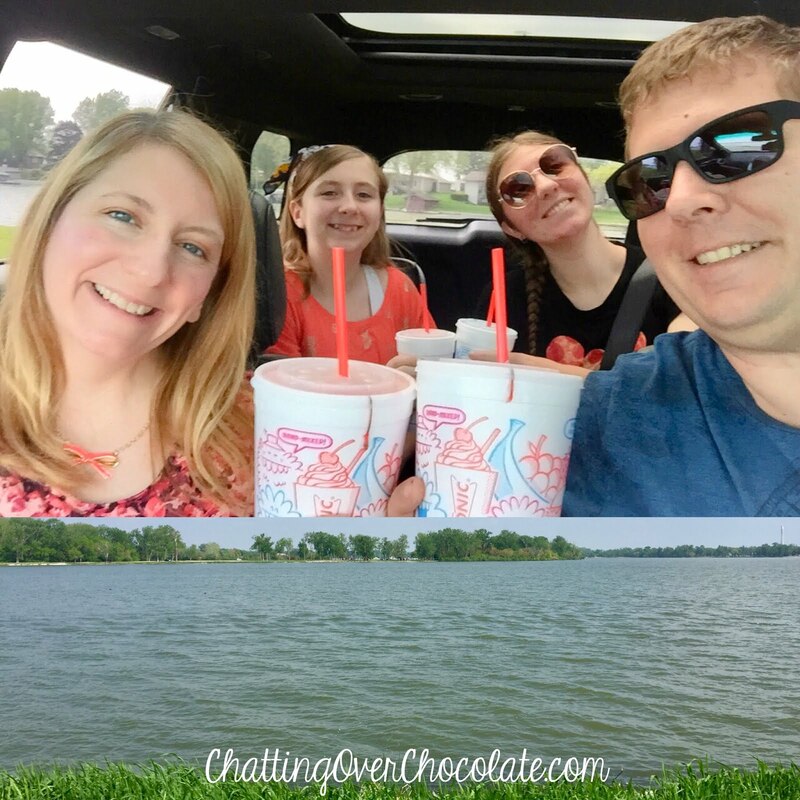 We took advantage of the gorgeous weather on Sunday with another trip to the lake, this time with diet cherry limeades and Sonic slushies in hand! Sunshine and sips with my loves made for a fun afternoon out! Love this handsome and sweet hubby who spoils me so! While dining, my family enjoyed a bit of Q & A fun! I printed off some unique "getting to know you" type of questions, cut them into strips, rolled into little paper scrolls and put them in a decorative bowl that matched our table setting. This is something I really like doing when we have guests over for meals as it makes for a fun ice breaker and allows you to get to know people better. Believe it or not you can always learn a thing or two about those you're closest with too! It even brought out a few stories we'd never shared along with a happy helping of reminiscing about our favorite memories as a family! If you're looking for a way to liven up table talk time, I recommend googling for some "getting to know you questions" or thinking up some of your own either about specific topics or a variety of things. 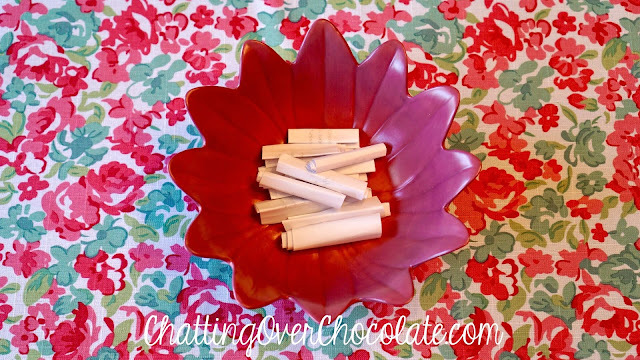 Then enjoy all the fun of the free flowing conversation that follows each new question! 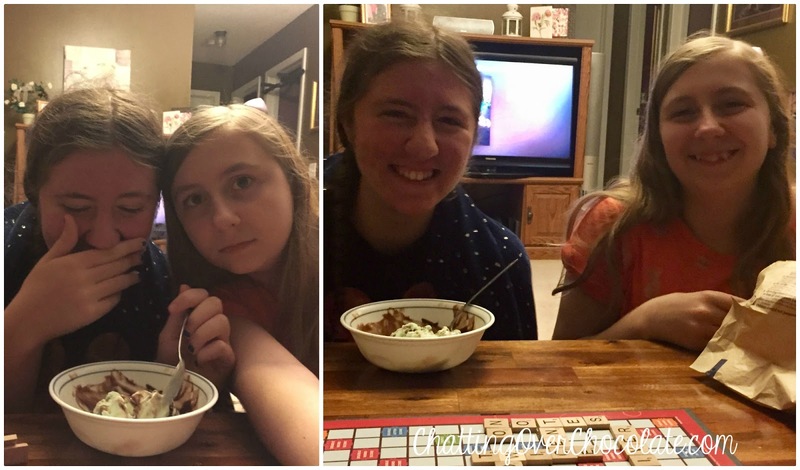 My girls enjoy it so much we went through every last question before leaving the table! 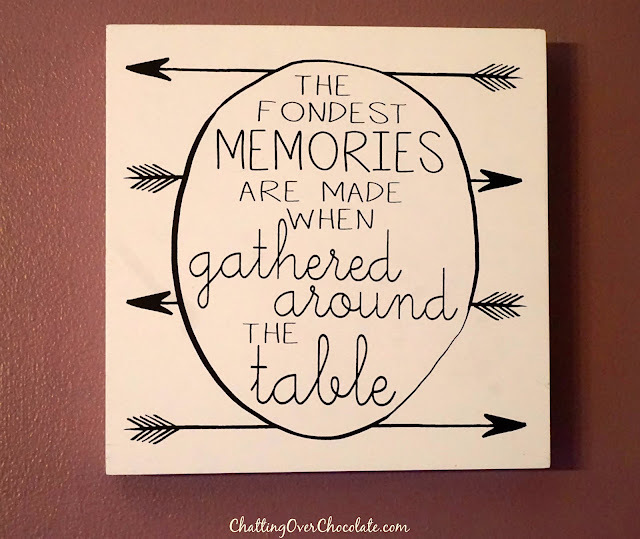 I love lingering around the table with those dearest to my heart! When I asked these silly sweeties of mine if I could take their picture one began posing ultra-seriously while the other couldn't stop laughing. This was followed by a gazillion silly faces and one sweet smiley snapshot. I tell ya, these girls make life fun! 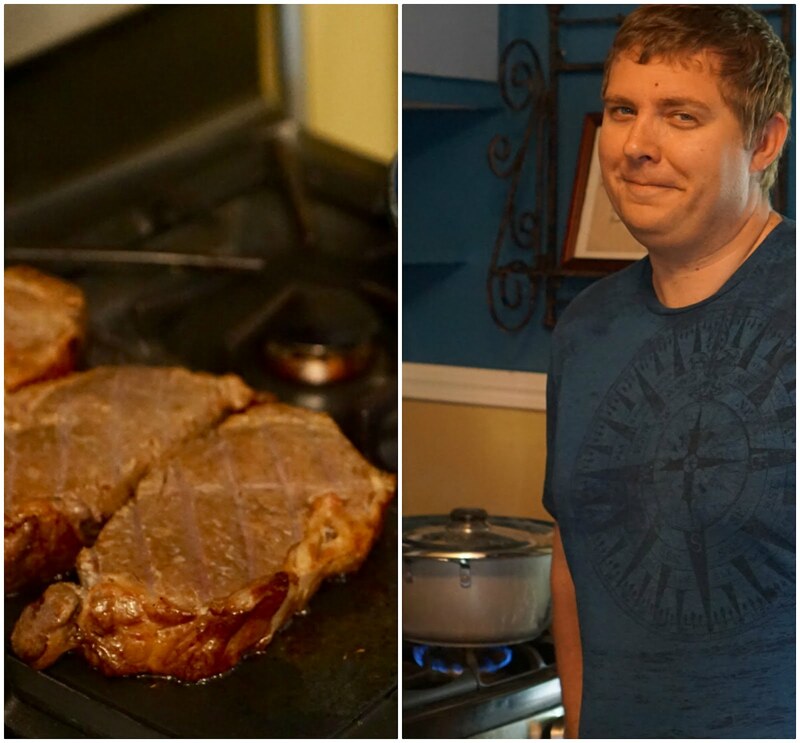 Last week our home improvement project brought my husband's side of the family for a dinner following the work. This week we had some loves from my side come by! My nephew was spending time at my parents' place so my mom brought him over to visit while my dad was here helping. My sister lives a bit of a drive from us so any opportunity to see her family makes my heart smile! 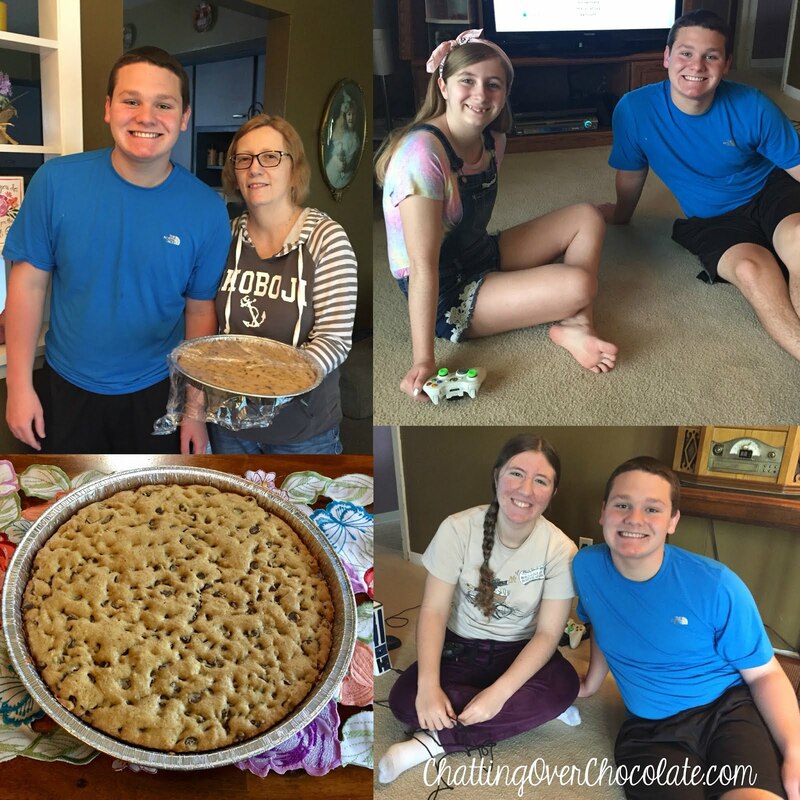 They also came bearing snackible gifts, including this chocolate chip cookie pizza he helped her bake before their visit. So "sweet"! My mom and I caught up with a nice long chat and flipped through some new cookbooks while the kiddos enjoyed some gaming goodness. Fun was had by all (of us in the living room anyway, elsewhere hard work was happening). Thankful for afternoons like this! 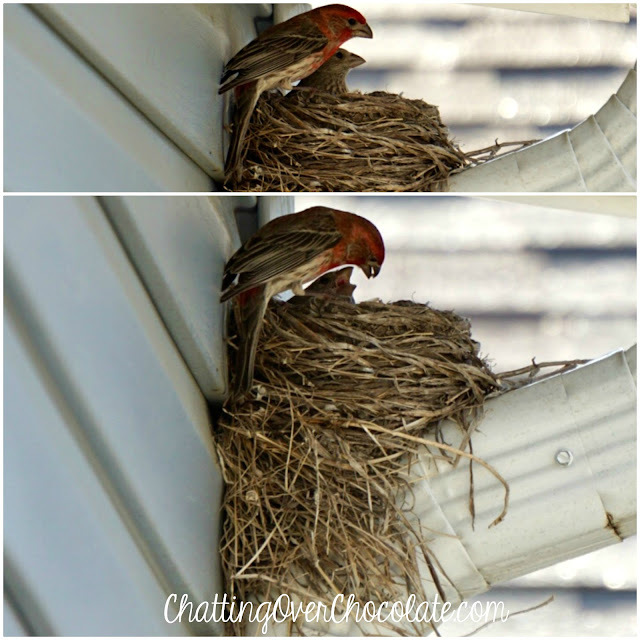 A fine finch made a home for her baby birds in our yard recently. This is the first time we've had a nest with these cuties here so it's been a delight to watch this spring! Irises don't last long, but they sure are beautiful each and every day that they're in bloom! 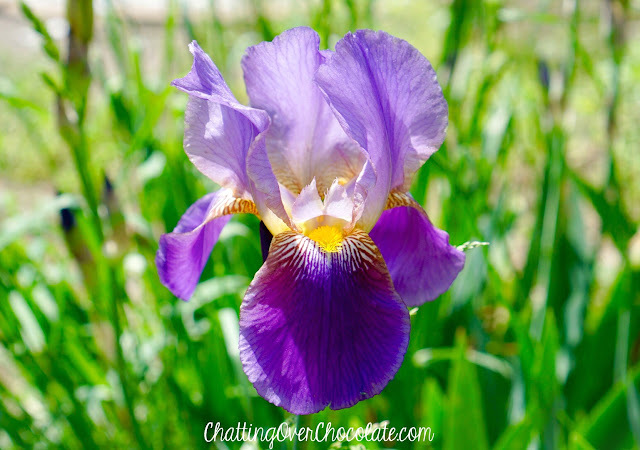 This purple beauty is one of the many reasons spring makes my heart sing! Thanks so much for stopping by today! Wishing you a wonderful weekend ahead! Trip Report Tuesday is BACK! WDW Day 1 // Thanksgiving Day Arrival + A Disney Dream Come True! That is such a fun idea to create your own drive in movie! the getting to know you game sounds really fun too. Those Irises are beautiful! Your hair also looks great in that picture of you all in the car. I saw the Greatest Showman a few months ago with my BFF and I loved it! I hope that you had a good week and that you and your family have a wonderful weekend! Sounds like you had a fabulous Mother's Day weekend Brenda! I love the idea of a DIY Drive-In! We had one by our house when I was young and I have such fond memories of going there in the summer with my family. Too bad they don't have any near me anymore. I love steak too and the ones your hubby made look incredible! Love the idea of the getting to know you questions. Fun! Hope you and your sweet family have a wonderful weekend! All your food is making me SO HUNGRY! So glad you had a special week. I love how you guys make your own drive in movies - that is so fun! I too saw The Greatest Showman recently and LOVED IT!! I watched it on teh plane ride to England and was kicking myself for not seeing it in the theater. I loved it. I have also been listening to the soundtrack which I also think is awesome! SO many fabulous Friday loves! I'm especially fond of the purple iris! I'll have to share with you soon the PINK goodness that's growing in our new yard! :) Happy Friday, sweetest friend! Your posts are always filled to the rim with delicious food and I love it. I am a total food lover. 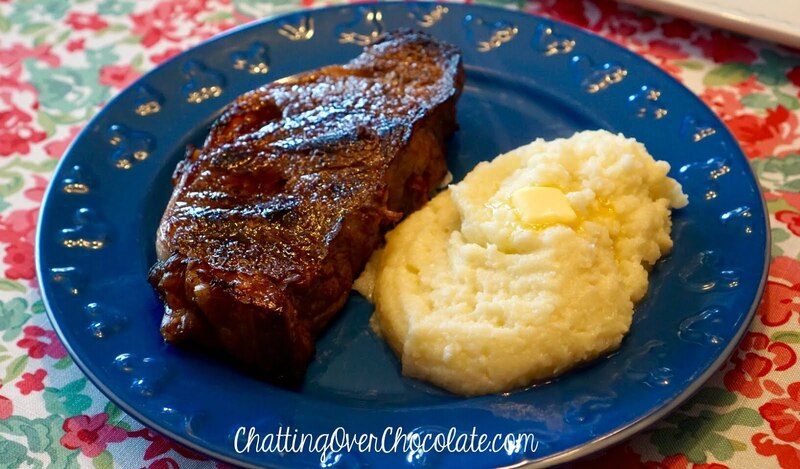 I have never made mashed cauliflower or tried it before, but it looks like regular mashed potatoes! I need to try this! I haven't played Scrabble in ages, but love it! That cookie cake looks soooo good. And, a movie night in the car? What a great idea! We have an outdoor theater NEAR St. Louis on the other side of the river in Illinois, but you have to watch 2 shows and the kids would be so tired by the end of it... so, we've never gone.